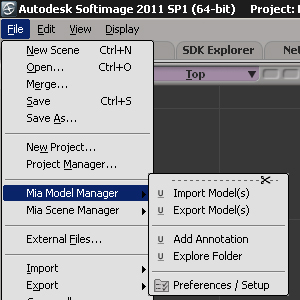 This addon allows simple management of models and scenes in Softimage XSI. It is based on exploration of files (ActiveXObject). Suitable for small pipeline, as a pilot series, a short or a commercial. But inadequate for bigger productions that generate thousands of files (series, films, etc. ...), where the use of a database will be smarter (and much faster in execution). It contains two plugins. One for the models and one for the scenes.
" Import models" to import model with netview (local or ref), where they are displayed with an image or not and they are grouped by prefix. "Add annotation" to add an Annotation on selected models. Annotation is named "Mia_ModelManager_Comments". By default it contain the date the user name. You can remove his infos or add yours. Annotation's content is read at the export and writes in a .txt file who is create to same location of the model. At the importation, the .txt (if it existe) is read, his content overwrites the infos in model and the Annotation Property is inpected. This allows to transmit informations about the model (state, version,...) and read edit his infos without opened Softimage (production note, list to do, ...). 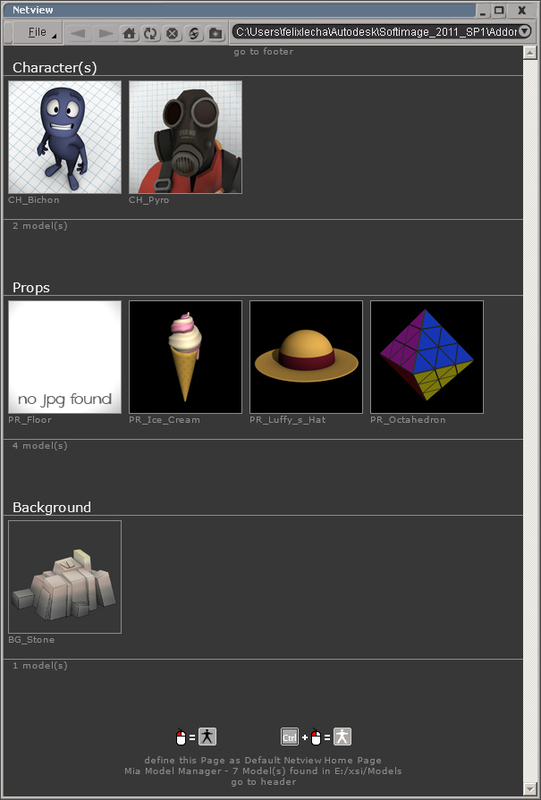 "Explore Folder" open the folder who contain the model(s). Folder path is defined in Plugin's preferences. Commands Import & Export don't work before you define a folder path in the "Preferences / Setup". Open the Netview to import model with the command : "Mia_ImportModel_Cmd();"
Export selected model(s) with the command : "Mia_ExportModel_Cmd();"
"Open Scene" allows you to open a scene normally. If a .txt file named like the scene file existe at the same location, an Annotation Property is added to the scene root with the .txt content. "Add annotation" to add an Annotation to current Scene. 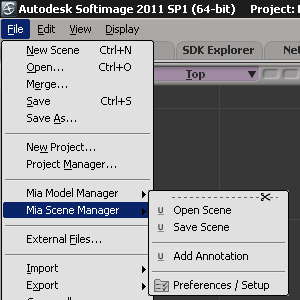 Annotation is named "Mia_SceneManager_Comments". By default it contain the date the user name. You can remove his infos or add yours. Annotation's content is read at the Save and writes in a .txt file who is create to same location of the Scene file. When you open scene, the .txt (if it existe) is read, his content overwrites the infos in the Annotation Property and the Property is inpected. 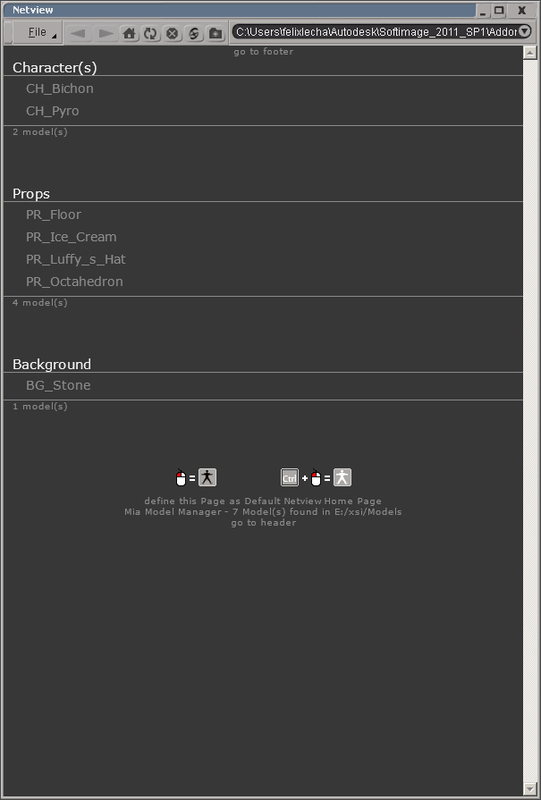 This allows to transmit informations about the Scene (state, version,...) and read edit his infos without opened Softimage (production note, list to do, ...). Open Scene with the command : "Mia_OpenScene_Cmd();"
Save Scene with the command : "Mia_SaveScene_Cmd();"
For the Mia_ModelManager, add Model's Picture auto generation. Why not ? Add Import several models at once. add Plugin : Custom Images Management.